Stormtroopers will be marching into the Menlo Park Library on May 13. 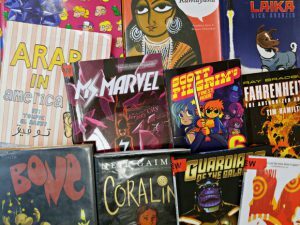 Those Star Wars characters, and several others, will be on-site for the library’s second Comic Con, a free-admission celebration of comics, sci-fi, games, and movies taking place from 3:00 until 7:00 pm. The event will feature live music, film screenings, artists & vendors, crafts, a photo booth, a family game area, and cosplay (the opportunity for attendees to dress up as their favorite characters). Two different musical groups will perform. At 3:30 pm, there will be steel pan performance by the Derek Smith Pankind Duo. Smith has been entertaining audiences for more than 10 years though his innovative music that combines the melodic brightness of the Caribbean steel drum with the driving rhythms of Calypso and Latin Jazz. Comic Con attendees can expect to hear the duo’s interpretations of video game tunes, Disney music, and beyond. At 5:00 pm, the Cantina Band will perform music from movies, video games, and more. Band founder Travis W. Hendrix grew up being inspired by the iconic music from Star Wars, The Legend of Zelda, Mario Brothers, and other games & films. He will be joined by bandmates Annie Cilley, Kalei Yamanoha, and Juliana Frick. There will also be a pair of film screenings. At 3:10, 1962’s King Kong vs. Godzilla marks the first color appearance of two cinematic giants; and at 4:45, the library will show V for Vendetta, the 2005 adaptation of the DC/Vertigo comic. The Star Wars characters will appear courtesy of three tribute groups dedicated to the film franchise: The 501st Legion’s Golden Gate Garrison; The Mandolorian Mercs Wolves of Mandalore; and the Coruscant Temple of The Dark Empire. Comic Con attendees are encouraged to dress up as their favorite comic, sci-fi, video game, or fantasy characters. A cosplay contest will allow participants to show their handiwork and vie for prizes. Educators & artists from the Walt Disney Family Museum will guide participants in drawing their own comic pages. Pokémon GO lures will be dropped at the top of each hour.